Thursday afternoon group class is consistently noted by students as a fun and productive way to take an hour out of the workday and enjoy some sun and socialization in our outdoor training area. This well-attended class is comprised of several short intervals of basic obedience training followed by stress busting group-play time. Yes, dogs are learning and practicing valuable skills and techniques alongside their handlers. Of course, socialization and unstructured free-time is very important, but the true magic moments of this class occur in the minutes that separate the two marquis activities. Every four years during the Winter Olympics, the unusual sport of the biathlon comes on television. This is a perfect example of the value of the transition. Athletes combine cross-country skiing with precision target shooting. Success relies on mastery of mind and body to perform each unique task on-demand. This is precisely what we are practicing by releasing our dog with a "go play" then consciously bringing them down from warp speed back to a learning mindset. This is real-world training. As humans, we often have places to go and we can't wait for our dogs to become exhausted from play. Other times, play may escalate into rough-housing or other predecessors of unsafe scenarios. In any case, the ability to spin-down from short abrupt bursts of excitement is an invaluable skill for a handler and dog to master. At the end of the hour, the switch is once again set to "off" for the final time. Happy faces and wagging tails calmly go back to the business of their Thursday afternoon. This is truly time well spent. Jackson an 18 month old a Black Mouth Cur, came to My Dogs Mind in April after being adopted a month prior. His owner was told about his "high-energy" by the adoption center but was instructed to continue giving him Benadryl® to help with that. Sad but true story. His high energy was indeed something that needed to be addressed, as it was fueling frustration and anxiety while on leash. Jackson was lunging, barking and just plain looking scary towards other dogs. My Dogs Mind decided the best approach for Jackson was to go cold turkey on the meds and adopt a three pronged approach towards managing his energy level and subsequent displays of bad behavior. Using his love for play as motivation he began his road to recovery. The first priority was more fun physical activity. He was quickly trained to run alongside a bicycle using a bike-tow-leash. The overall positive effects on Jackson's behavior were apparent by just providing him an ample amount of daily exercise. 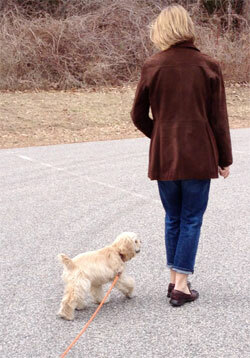 Part two was the introduction of obedience training, most importantly how to walk on leash. It is important for him to understand how to behave and what is expected by him before reintroducing temptations that previously led to a loss of control and aggression. The recipe for the third and most crucial step in therapy, is providing and rewarding Jackson with a better outlet for his unfocused energy than bad behavior, when confronted with the stress of another dog. Play, specifically a game of "tug" proved a great activity for him. By rewarding Jackson when he ignores the temptation of other dogs with a good round of tug, we are able to offer him a better release for his energy and an alternative to the old way of dealing with it. The positive alternative to mayhem is the redirection of attention back towards his handler. With enough practice and tug as a reward, this refocusing will become a good clean habit. Having a great relationship with your dog takes a lot of work, a ton of patience, and the humility to remember you are only half of the equation. If you are up to the challenge, you need only look down to find your willing partner. Whether it’s kindergarten for your pup or night-school for a rescue dog, the foundation for a happy, well-adjusted dog is constructed with time and guidance. The domestic dog brings with it an evolved ability to learn and comprehend. It is your job to provide them with the social situations, direction, and experiences to help them cope and thrive within the complexity of the human world. Building off activities your dog innately finds enjoyable is a wonderful tool to incorporate into your training arsenal and will help you reach a more advanced training level. It is important to recognize your dog's natural talents and incorporate them into your training. Maybe you wanted a "fetcher" but ended up with a "sniffer". Put the ball away and start putting that nose to work. Teach “find it” and be proud of your retriever that can find a piece of kibble hidden under your dirty laundry! Working against your dog's nature is much like trying to fit a square peg into a round hole. By understanding your dog and what drives them, you will have two of the most important keys to a happy and successfully trained canine. Teach, play, accept and enjoy. Pour your heart into building a relationship of trust and understanding. Rest assured, at the end of the day you will find an outstretched muzzle across your lap and hear a drawn-out exhale whispering back, “It's working." Pups have a great capacity to learn, even at a very young age. Everything is a new experience for them and trial-and-error is how they roll. During this time of discovery and distraction they undoubtably do many of the wrong things. But mixed in with all the shenanigans are desirable behaviors that can be encouraged to be used as predecessors to formal obedience training down the road. A long line is a great way to give your pup a little more freedom without letting them off leash. Although traditionally used for solidifying "recalls", at this stage it is simply an appendage and not for correction. Let it drag behind as you walk. This will help later when you begin loose-leash walking. Your puppy will surprise you with how quickly they decipher rewarded vs. non-rewarded behaviors. You might even be inspired to try more structured training with them. Wait. At this stage it is important to give your puppy plenty of constructive activity with zero correction. You can begin to mark behaviors but do not force them into making or holding a position. We are talking weeks not months of waiting. It won't be long before you can move forward with basic obedience, they grow up fast. I don't know who made up dog years or how they got stuck being multiplied by 7. It's just not fair. There too quickly comes a time when your BFF is slower to action or has a little hitch in their get-along. Now is not the time to go quietly into that good night! Gaze past the fog of cataracts into not a flicker, but a blaze of enthusiasm. Run your hand slowly through soft fur, over knobs and lumps. Feel that? That is the spirit of living in the "now". The selfless instinct to play the dealt hand and forge on. Yes, an unwavering heart is a good thing. But using your brain to structure alternate activities that will be safe and enjoyable for your dog is even more important. Jogging and hiking out? Or are they? Start thinking of creative alternatives or new opportunities to spend every bit of valuable time together. Harnesses are a great way to leash-up older dogs. Even better is a padded harness with a built-in human handle on the top and a tie-off point on the bottom. The Ruffwear harness is just about perfect. The handle comes in ahhh… handy for helping your dog get up, over, or across uneven ground. The tie-off point underneath can be used, with a carabiner and some rope, as a restraint for riding in the back seat or cargo area of you car. Seniors just can’t take the corners like they used to. So, something to keep them securely in one place will keep them from rolling around like a loose cantaloupe. Just cause they’re old, doesn’t mean you have to cut your excursions short or leave them behind after an obligatory spin out to the end of the driveway. Break out the red wagon or, better yet, something like the Burley Tail Wagon. Walk a little. Ride a little. You will be surprised how easy it is to train a tired dog to jump in their wagon and lay down on a soft bed while your hard work keeps the wind blowing under their ears. Another nice thing about a carrier like the Tail Wagon, is that it doubles as a crate with shade and security. It also opens up more opportunities for bigger excursions like taking the train into the city or biking long distances. Just remember, senior dogs can tire quickly but will hide their pain or exhaustion the best they can. Recognize when they need a rest or a drink before they do. They usually thank you for the good idea by quickly lying down or taking a drink. With age comes refinement. In years past, this activity might have equated to an afternoon at Chuck E. Cheese's. Now you can slow down and relax like two old friends sipping espressos in the afternoon glow. Bring a bed along with you. Not the big puffy corduroy one from the living room. Try an old yoga mat or something that can be rolled and washed easily. Not only does a bed provide comfort, but it also indicates a "place" where your dog can stay safely out of the way. Pack a collapsible water bowl and fill it from your water glass. Don't forget to check with the establishment prior to entering to make sure you understand and can comply with their dog policy. Alert your server that you have a dog. You don't want them to unexpectedly feel a wet nose against their leg when they are serving you hot plates of food. Above all, be low-key. This is for your enjoyment, not everyone else's. You know you both did great if you hear "I did not even realize there was a dog down there," from other diners as you leave. Cast vanity aside and use handled harnesses, sweaters, wagons, non-slip socks or whatever else works. After all, your dog is not self conscious about their grapefruit sized lipoma. Embrace your freakiness and enjoy every day you can together. Training touch sensitive dogs can often be a challenge because many of the techniques we come to rely on for rapid behavior repetitions, think "push the tush", just will not work. Any contact or gentle guidance at this point in their training triggers a defensive vs. constructive mind-set. 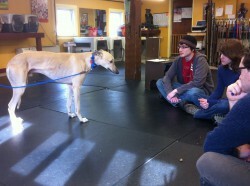 Rambo (track name, appropriate name pending) is a very gentile ex-racing greyhound. Just about everything is new to him, but he likes to take things at his own pace. The easiest way to mark a new behavior is to just wait for it. Today Rambo's pace was much slower than our allotted class time. With such powerful legs and so much to see in the training room he probably would have remained standing long-after we hit the lights and went to bed. We decided to use obstacles to move things along. This allows him to begin a natural movement and for us to mark and reward his progression. Not only did my leg serve as a limbo pole, but using my body also allows Rambo to get used to being handled passively by him initiating close contact.